The Sun is red and getting dimmer year after year. The winters are getting colder and now a freeze is set to happen that will last for the next 40 years where the world will ice over and only those who have prepared may live to tell their children of how the world was before or so hope the leaders of this world. With Nights of Villjamur Charan has landed and brought his unique insights and clear, distinctive voice to the world with a skill that belies his age. 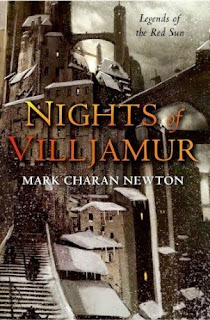 Nights of Villjamur is the first book in the Legends of the Red Sun series by Newton, which has been lauded quite well in the UK since it came out there last year. This is Charan's US debut, although his UK debut was The Reef from a small press that can be a bit hard to find. 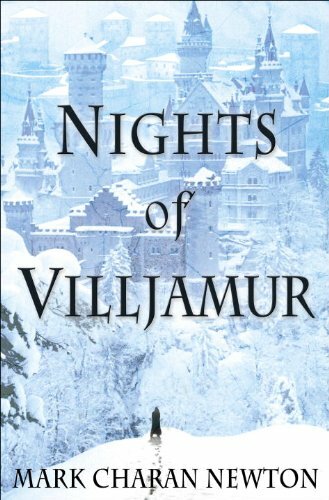 I've seen reviews that make Nights of Villjamur out to be a cross of Vance's Dying Earth and Mieville's early work, which is definitely on the spot. However, in many ways I found the writing and characters more approachable than in any of the Dying Earth books I've read to date. Villjamur the titular city is the largest in the world, alluded to be a far future Earth. Villjamur is a character of its own few other fictional cities can be compare to. It is dark and moody, but shows signs of love and selflessness albeit with plenty of venom and conspiracy down dark alleys. Great and wonderful things happen in Villjamur, but even more dastardly and vile actions, people, and plenty else are a foot. This is not a land of heroes, but of survivors. As the ice encroaches in on civilization people from all over are traveling to the largest cities of the world with Villjamur being the goal for the majority since it is the capital. Thousands have flocked to the city just to be shut out of its gates where they live in squalor and continue with the hope the city of their leaders will let them in for a chance of survival. But the leaders of Villjamur are not too kind and worry for the long term life of the city given the ice age approaching and only enough food and stores for so many citizens. The story is told though about half a dozen points of view, but a few others pop up intermittently. Brynd the albino captain of the Night Guard was definitely my favorite as he appears to be the most together character. Still he is the most fragile in many ways, which is a mean feat for a warrior of his class as he follows the will of the empire. There is Radur the ne'er do well who has some real physical skill that I hope gets showed off more in the future. However, I couldn't get over my dislike for Randur at all, but found his chapters enjoyable especially his time in the darker parts of Villjamur. There is something that feels very questionable about him and what he is doing even after events change him. Still I want to find out what happens to him, which I think says a lot about the story and world Newton has created that despite my dislike I need to know what he is up to. Jeryd is an investigator in search of a killer and his part definitely plans the noir murder mystery angle to its fullest. He is also a rumel, which is a sort of human/lizard, but I have trouble picturing the species well. This is only one of the many unusual species met in Nights of Villjamur and hardly the strangest. Urtica, a leading member of the ruling council has the only tiresome point of view as his aims are quite opaque. But the most interesting character of all is Dartun who is a leader of a cultist group. Cultists were one of the most intriguing groups meet in Nights of Villjamur amongst many as they are a cross of wizard, scientist, and alchemist who safeguard ancient technology akin to magic. Well maybe safeguard is the wrong word. More like use for their own purpses while perpetuating their sect. Dartun is one of the oldest members of the cultists, which is why I couldn't wait for more of his chapters although they are a bit sparse except toward the end. He just knows so much about this world that I want revealed. Nights of Villjamur is a story of a world far removed from our own comprised of very many different elements. It is a murder mystery, a love story, political novel, literary Fantasy, Horror (only slightly), but most of all it is inventive in the right ways and just plain weird at times. Making technology out to be magic and creating sub-human species worked really well and just wait until near the end to see what shows up. I'm still unraveling that puzzle in my head. Nights of Villjamur couldn't have been written at any other time. It feels perfect for the here-and-now with it sometimes strong prose and complex world worth visiting again and again packed with a beauty, starkness, and realism seldom seen in Fantasy. Newton's influences are plain to see, which he holds forth proudly. This is a series to get lost in that will only get bigger, better, and weirder, which will ensnare you with its gracefulness and down-right oddness. It is without a doubt one of my favorite reads this year. There are some flaws although small. One of the evil doers is just too predictable as was a coming together of lovers, and I guessed one of the killers rather a bit too early on. Still fans of China Mieville, Richard K. Morgan, and Scott Lynch should take note. Scratch that. Fans of Mieville, Morgan, and Lynch should run out the door in search of a copy to find out for themselves how good this book is. I give Nights of Villjamur 8.5 out of 10 hats. Charan shows a lot of promise and I think he'll only get better from here with his beautifully demented mind. The sequel in the series, City of Ruin, has just been released in the UK and should be out in the US about this time next year.